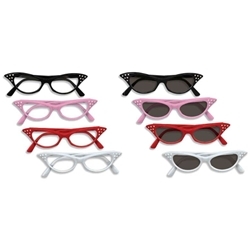 Includes one pair of 1950's rhinestone cat eye glasses, available in black, pink, red, or white with either clear or tinted lenses. One of the most popular style of glasses for women and girls from the 1950's were cat eye glasses, so named because of the pointed edges. These 1950's cat eye style glasses are adorned with 5 clear rhinestones on each point of the frames. The 1950's rhinestone cat eye glasses are great for Grease, poodle skirt costumes, sock hops, and other 1950 themed costume parties.